Blair Hurley explores Buddhism, Boston, faith and power in her debut novel. 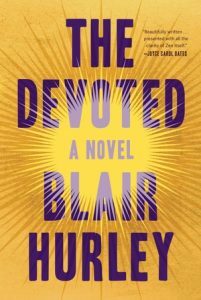 In her novel The Devoted, Blair Hurley tells the story of Nicole Hennessy, a student of Zen Buddhism who comes under the influence of her powerful master — and struggles to escape. Blair answered some questions from Reading Group Choices about her book, her Boston and Catholic upbringing, her role as a teacher, and how we come to terms with our pasts. Reading Group Choices: The main character, Nicole, moves from being a student of Zen under a powerful master to a teacher of others. Can you talk about your own movement from a student of writing to a teacher? 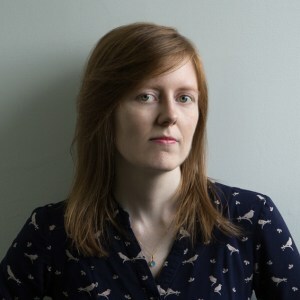 Blair Hurley: Like Nicole, I always thought there would be a definitive moment when I felt myself to be a master of writing, and then (and only then) would I be authorized to teach. But it rarely works out that way. Instead, I started teaching when many of my students were older than I was, and I was still figuring out my own theories and ideas of what makes writing great. At first it can feel like you’re laying down railroad tracks right in front of the approaching train, learning right alongside the students. But there’s something exhilarating and wonderful about being in dialogue with your students rather than talking down to them. Now I feel confident in what I know, and in the value of my teaching; but the teaching is always more effective when I’m in conversation with my students, wondering and working out problems in technique or finding exceptions to every rule of writing I can lay down. In The Devoted, Nicole stumbles into teaching when she knows she still has a lot to learn; but this humble awareness of her limitations is what makes her a good teacher. RGC: The Master is a complex character: He uses his position of power over Nicole to keep her beholden to him, and yet he is moved by a genuine recognition of her potential to achieve enlightenment. Can you talk about the decision to complicate what might have otherwise been a more base abuse of power? BH: The Master definitely evolved as a character over the course of several drafts. At first he was more of an amorphous villain, chilling and malevolent without much interiority. But over time I realized that wasn’t very compelling. What makes him interesting as a character is that challenging moral gray area that he occupies; he has genuinely helped Nicole advance her spiritual study, at the same time that he wants to completely control her life and keep her his student forever. I wanted to more authentically represent the way these abuses of power have occurred in the real world. Deeply respected teachers who greatly helped many of their students were also abusing their power, sometimes at the same time. People are rarely angelic or demonic; they can be both at once, and I was interested to explore the Master’s good intentions as well as his disturbed ones. RGC: Nicole’s practice of Zen Buddhism draws her into conflict with her Catholic family, particularly her parents. Doctrines aside, what qualities do the two religions share in terms of the people who practice them? BH: There’s a lesser-known mystic aspect to Catholicism that I felt had a lot in common with Zen Buddhism. The more I researched, the more parallels I found in the way people spoke of their practice and the role it played in their lives. In Catholicism, prayer is very important, as is discipline and the shedding of worldly temptations and concerns. Catholic monks and nuns contemplate the divine and pray and meditate in very similar ways to Zen monks and nuns. There’s also an intimate relationship with a teacher or priest that felt similar to me; the privacy and sacredness of the confessional has a lot in common with the private space Zen teachers share with their students. In both religions, practitioners speak of a personal, radiant closeness to the divine or to enlightenment. They are also very stern, rigidly governed spiritual institutions, with strict rules. There is no halfway in Catholicism or Zen. RGC: You present the closing of Catholic churches in Boston after the abuse scandals first became known. Nicole accepts the closures in a way that her mother, who is devout, cannot. Can you talk about how faith stays strong — or becomes even stronger — in the face of such a serious scandal? BH: The power of Catholicism stems from how your faith is not just what you do; it’s who you are. Catholicism is your family’s identity and your identity, and that is not easily shed, even if the people representing the faith betray it. The authority and sacred power of Catholic symbols, traditions, and leadership figures meant that few Catholics wavered even in the wake of such appalling abuse and corruption. It’s a kind of sunk-cost fallacy, where if you’ve poured yourself into a belief, and shaped your life around its promises, its certain view of the world, you will only cling to it more in a crisis. I think in an odd way, Nicole’s mother’s faith is what sustains her through the crisis. She can accuse individuals of betraying the faith while still believing in its principles. And for her, the sacred spaces that have meaning for her, those churches scattered across Boston, are a refuge in a time of trouble, and they represent something pure and inviolable. It’s hard for her to imagine that for the survivors of abuse, those spaces that were meant to be safe become dangerous. RGC: You have lived in several different cities, including Chicago and now Toronto. What parts of you — qualities, sensibilities, attitudes — still retain Boston? B H: Your hometown is always a part of you, I think. Now that I no longer live in Boston, it’s my gentle nostalgia and homesickness that powers a lot of my writing, and allows me to write about the city with clearer eyes. As for the parts of me that are still Boston, there is the part of me that has no patience for slow drivers; there’s the part that craves Dunkin Donuts and Hoodsie ice cream even on a subzero winter day; the part that can slip into a Boston accent; the part that is recognized as having Irish roots wherever I go, thanks to my name and my hair; the part that likes long train rides through rainy, woodsy suburbs; the part that loves the odd blend of artsy intellectualism and gritty townieism; the part that has a New England squeamishness about displays of emotion or having too much happiness at once; the part that is disdainful of sentimentality; the tendency toward churlishness and tribal loyalty; the reverence for old things and sacred spaces. Basically, the best and worst parts of me all still belong to Boston. RGC: Given the rich portrayal of Boston in the novel, could you have written it while living there? BH: I think I needed a little distance to achieve some of the more clear-eyed assessments of what makes the city both great and flawed. I was writing scenes while still living there, and it helped to be able to visit specific places and capture the sensory details. But the passages about nostalgia, or about Boston’s problems, or about its gritty loveliness, all came later, when I was missing it. RGC: What have your own writing “masters” taught you about what it means to be an effective teacher? I’m happy to pass on these lessons, too, as they give students something concrete to latch onto to improve their writing in measurable ways. And other teachers taught me more dreamy lessons about inspiration and motivation that are equally powerful. I’m grateful to teachers who were honest about how truly difficult it is to write a novel, how almost no one gets it right on the first try, and how at the halfway point it will feel like a sinking ship, but you can still steer it in to shore. I’ve tried to pass on those words of encouragement to my students as well. I think effective teachers offer a blend of the practical and the emotional, to give their students real tools to work with and emotional armor for the hard journey ahead. RGC: Nicole is tracked by the Master while living in New York, and yet her story involves other defining events, such as the loss of loved ones, that pursue her emotionally. How do you understand trauma and grief, the power they hold over us, and our inevitable reckoning with them? BH: In many ways, Nicole’s story is about the trauma of the past; to some extent we all carry the burden of our pasts with us, and instead of running away from it, we need to find ways to shoulder those burdens and carry them gracefully forward into our lives. To me, grief is very physical; it marks us, and it changes us forever. When my mother’s father died, she turned to me and said, “Now life will never be the same again,”, and later, when my mother was dying, I had the same thought: now the life I thought I would lead is forever changed. When Nicole loses her father, I gave her that same thought. Life is not always what we imagined it would be; but there is still the capacity for joy in it, as long as we let go of the vision of that other life we thought we’d lead. In Buddhism, we are supposed to always be aware of the impermanence of things. Change is the only constant. But that’s not a bad thing. Over time, I think Nicole can realize that being open to change can lead to an understanding of her grief, and an acceptance of the way her life has changed. I hope readers who have felt grief of their own can gain some solace from this part of the story. Life is beautiful and marvelous and terrible and it is always changing, and we can appreciate the things and people we love all the more for knowing they won’t last forever.